A look at the first 100 years of AFS (produced by our friends at AFS USA). 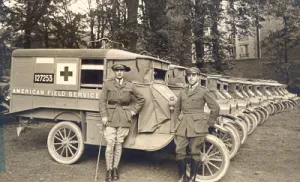 AFS Intercultural Programmes began as the American Ambulance Field Service (later to be known as the “American Field Service” or AFS), a voluntary ambulance and truck organisation which emerged soon after the outbreak of World War I under the leadership of A. Piatt Andrew. AFS participated in every major French battle, and the 2,500 volunteers carried supplies and more than 500,000 casualties during World War I. The ambulance service was reactivated at the start of World War II by Stephen Galatti, who had been an ambulance driver and Assistant General Inspector to Andrew during World War I. By the end of the war, 2,196 volunteers had served in France, North Africa, the Middle East, Italy, Germany, India and Burma, and carried more than 700,000 casualties from both sides of the war. Following World War II, AFS ambulance and camion drivers from both World Wars assembled in New York City to have a reunion and discuss the future of the organisation. 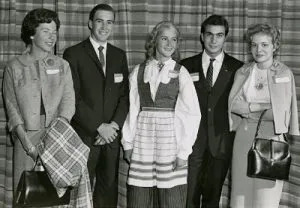 Under the leadership of Stephen Galatti, they launched a secondary school student exchange programme that they hoped would maintain and strengthen the international friendships and understanding they had fostered during their wartime humanitarian work. In 1947 the first secondary school students arrived in the United States on a scholarship programme. The AFS Programmes continued to diversify over the years by adding community service (18+) projects and teacher exchange programmes in addition to the traditional student exchanges, and the number of participating countries rose steadily. AFS is a global community of more than 50 partner organisations that support intercultural learning, principally through exchange programmes. AFS Interculture South Africa, formed in 1958, is a volunteer, non-profit organisation which promotes and facilitates intercultural learning and awareness through exchange programmes and other intercultural learning activities; to help people develop the knowledge, skills and understanding needed to create a more just and peaceful world. We are a volunteer-led organisation with chapters from Cape Town to Phalaborwa, from Durban to Johannesburg; 25 chapters in all. 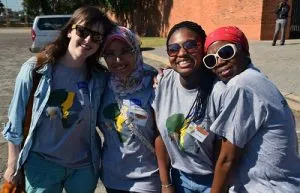 Our chapters are made up of ordinary people in diverse South African communities; all with one goal, to support intercultural exchange programmes that work towards creating a more just and peaceful world. Each chapter develops relations with schools in the community. It is from these schools that South Africans are selected to go on exchange programmes in other countries and to these schools that high school students come from around the world. The chapters also develop relations with Non-Governmental Organisations, NGOs, in the community. It is these NGOs that host the 18+ volunteers from around the world; young people who want to learn about another culture while supporting the work of a local organisation. Each year we make it possible for South Africans to welcome into their homes and experience the friendship of hundreds of participants from around the world. 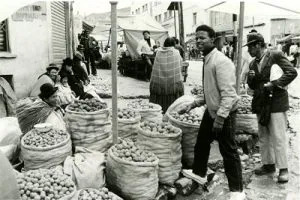 The same intercultural learning opportunities are provided to South African citizens to live in a foreign country, learn a new culture, a new language, and, in short, to learn ‘a new way of seeing the world’. In recent years AFS has been supporting returning exchange participants to learn about changemaking and what they can do to promote positive change in their home communities. AFS in Africa (South Africa, Kenya, Ghana and Egypt) have begun to offer short exchange programmes that bring together participants from the four countries to work together. The programme focusses on leadership capacity building and change making, sharing insight about cultures and traditions. The programme is designed to build future leaders within their communities who share an African identity, with the aim to develop positive and lasting relations and social cohesion between citizens of the African continent.